A huge Thankyou for everyone who is keeping in touch with your puppy updates and progress, Please keep them coming. 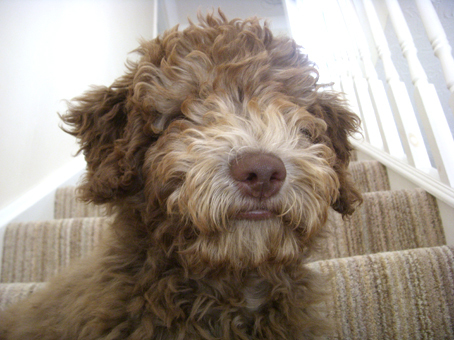 I just have to write to you to say what a wonderful dog our Flossy (was Denni) is. It was the biggest and best surprise ever, we had no clue and then there was a little black puppy sitting on our dad' s lap, which to us was unthinkable as he is so allergic to every animal! 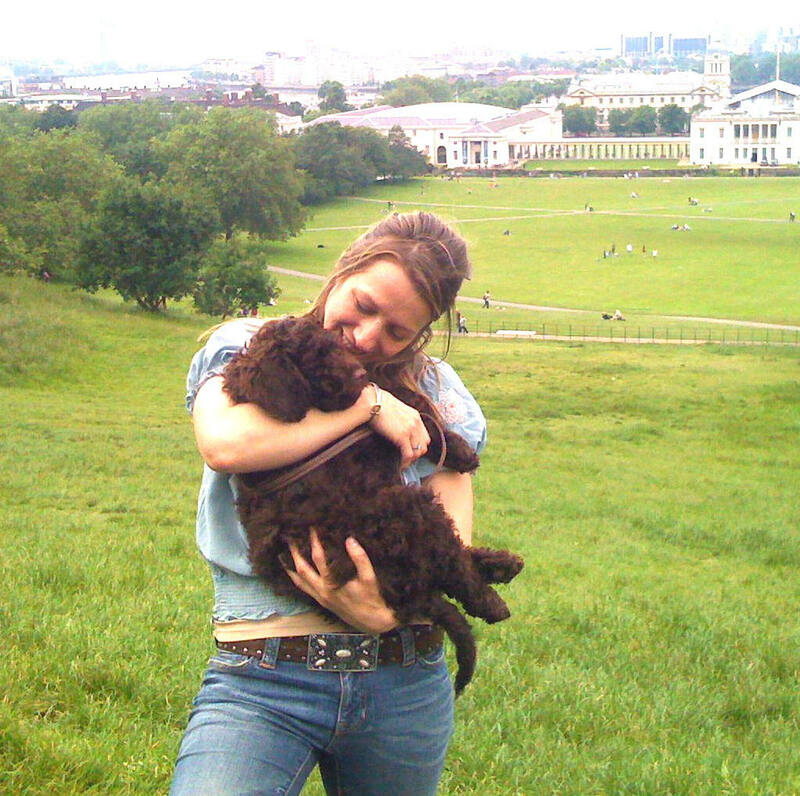 This was nearly two years ago; she was born on the 3rd March 2010, and now we cant imagine ever being without her.Mum tells us how she and Dad picked her up from the petrol station in London, and how they couldn't believe it was our puppy! 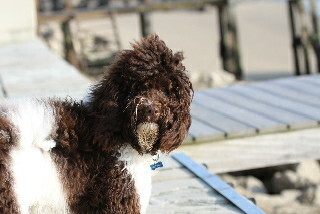 Flossy has the most amazing temperament ever; she comes everywhere with us and truly is part of the family. Flossy gets on with everybody, little children dress her up and she doesn't bat an eyelid and everywhere we go people stop to admire and complement her! She is energetic when out and about with us and loves swimming in the pond and jumping horse jumps and at the same time loves to sleep by the fire! 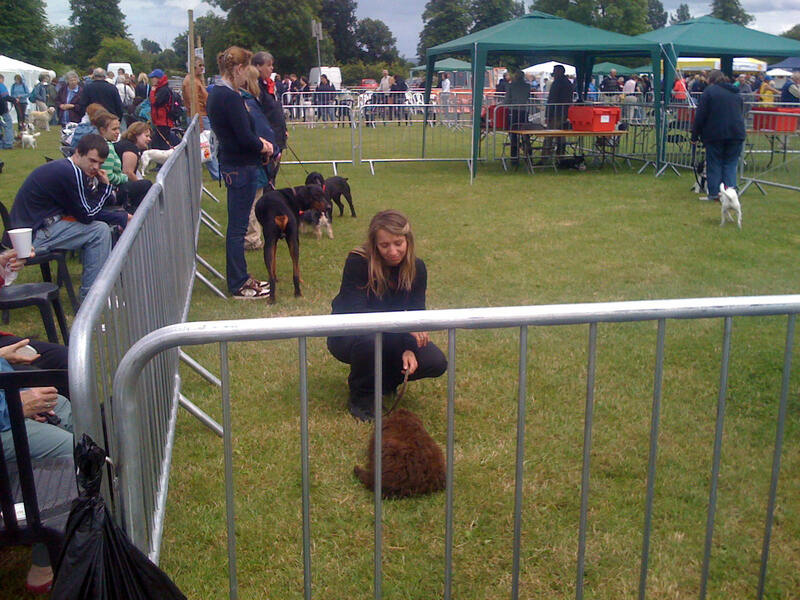 Flossy won 'The most obedient dog' at a local dog show we entered in the summer, proudly showing off her tricks; sit, paw, lie down, play dead (she is so easy to train!) 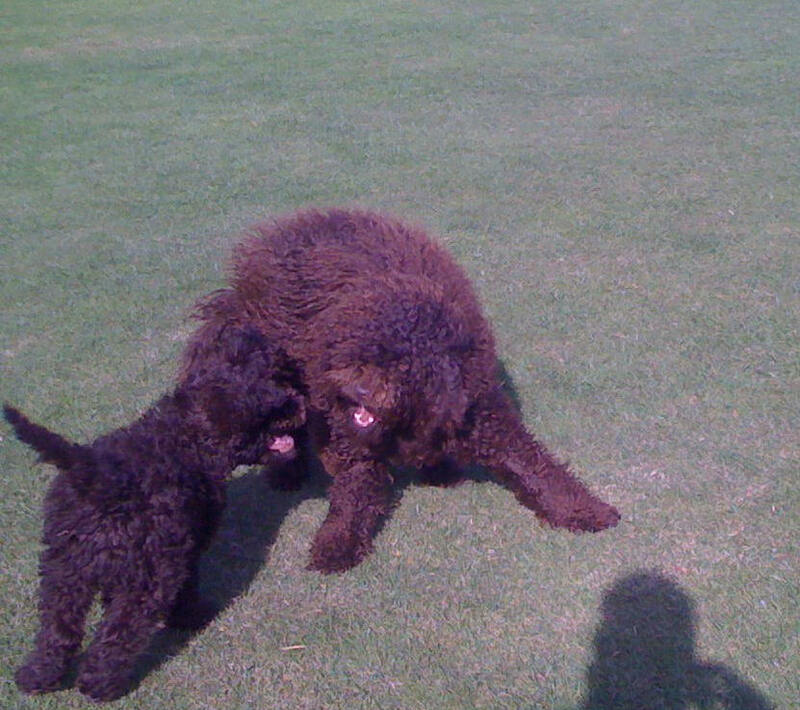 We also met up with another doodle last year, who happened to be her full brother from her litter, Digby (then Shadow) and he and Flossy had a reunion! We really cannot rate her enough! Thank you so much for breeding her, she is our best friend and we love her to bits! 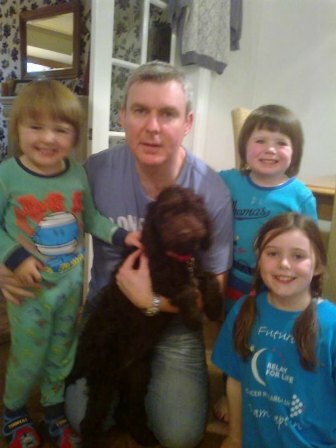 Mike, Mari-Clare, Mariella (15), Grace(12), Sebastian(10), Roseanna(7) and Flossy! She is doing very well, and adjusting great to our family. She is is such a lovely outgoing and cheerful puppy. She is really stubborn and playful and has het own view on some stuff hehe. 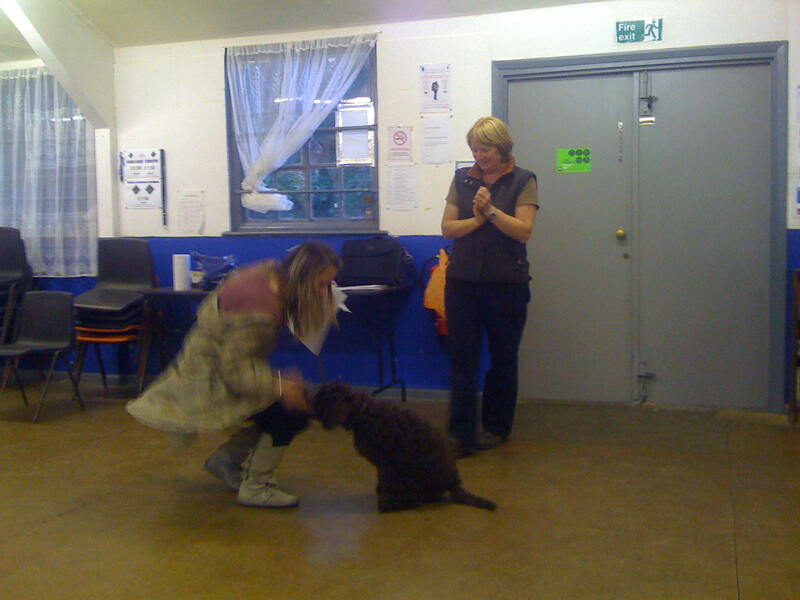 We are going 3 times a week to the dog training school were she is learning a lot, she loves to learn. Every day we are going to a playing field (for kids, so no other dog droppings for now) to play fetch, because het most beloved activity is fetching a ball..We are throwing it low across the field so she doesn't jump. Today we went to the vet, for her last vaccination, and we met the groomer...witch is great because she hates the brush, eventho we brush train her 2 times a day. Also we play mind games with her, searching food and toys across our home. I send some pics of Puff with this e-mail, and hope you like them. We are so happy with our little bouncing puppy. If we ever want another ASD puppy we will go to you first. Sandy and family from Holland. So sorry for not getting in touch sooner but I thought I would write to let you know how WILLS is getting on. 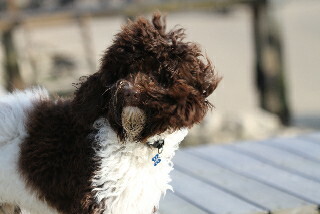 We purchased him from you in April from Molly's & Horatio's litter. He is 6 months now. I cannot put in to words how delighted we are with him. He is a definite part of out family & has brought so much happiness into our home. I have attached some photos for you. I just wanted to say how much we are enjoying Hugo. 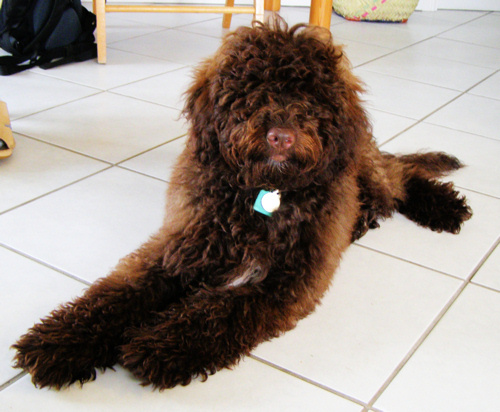 He is a wonderful companion, loving, playful, obedient and just a treasure. He wants to learn new things all the time and is always up for a game of ball which he retrieves willingly. His coat is like soft silk, which he loves being brushed and combed. He loves my bengal cat who he plays with all the time, that is when he is not playing with my English labradoodle or me. Thank you so much for breeding such a wonderful companion, I have told so many people about you as wherever I go he is admired. now too rusty with all the rain we've had!! Apologies for not contacting you until now. I will send some pictures by phone as cannot send via broadband as too big, which try and show you that Barney is having a great time and is a very handsome boy. As we live within 200 yards from the sea, in Seaburn, Sunderland, we are on the beach every day, and he spends a lot of his time in the sea, which he loves. He has always been great with everyone, young and old, as well as with other dogs. Everyone smiles when they see Barney. He is brilliant fun, is a real character, and I think he is part human as he understands everything that we say and often behaves as one of us. It is fascinating to see how he uses his legs and paws as effectively as we would arms and hands. Anyway, I am beginning to sound like one of those doggy people I used to think were borderline insane, but unfortunately I cannot help myself as I love my dog to bits. I had wanted a dog for 40 years, but as I have always been badly allergic to animals and came out in a nasty rash, sneezed, eye streamed etc if a dog licked me or came near me for any length of time, I never thought it would be possible. 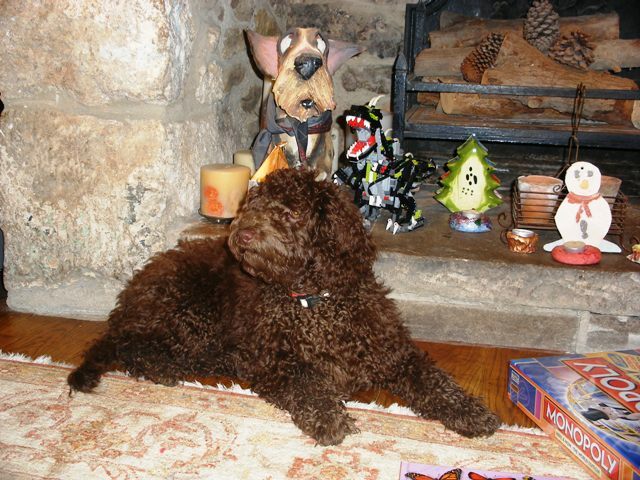 However, I have never had any adverse reaction at all to Barney, and he was worth the wait. So for anyone who is badly allergic and is wondering… go and do it, it’s brilliant. On Wednesday we celebrated Bommel's birthday at our house in France. We love him so much and he is wonderful with all the children that come to play with our kids. His Hair is really short to help him cope with the heat. Happy New Year to you and your family! My apologies for not emailing sooner,....Well, what a wonderful chap we have (Charley is his name)...from the very first week in his new home we haven't had any concerns at all. He has slept through the night since he came (except for a couple of times when he needed to go out but went straight back to sleep) He is clean in the house now and no chewing of expensive furniture (yet!) We have to watch our shoes as he has an absolute passion for them He just cant help himself! He is such a joy! He settled so quickly and is so bright. He is never fazed by anything only curious no matter how many people or noises are around we are able to take him anywhere. He learns very quickly as he wants to please and responds so well to calm instruction with rewards!!!! Yes, he adores his food-we still have him on the same but have introduced a bit of chicken and raw tripe which he loves. He was 9lbs when we first bought him home.....he weighed 18lbs yesterday!!!! He seems to grow, change and mature every day. 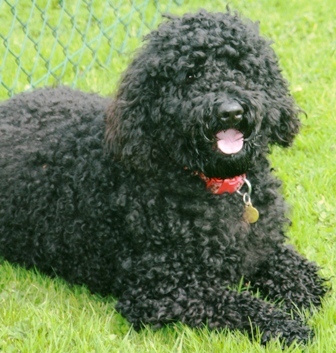 The vet was very impressed with him and your meticulous record keeping of care and so are we Rai. We have an amazing little chap (well...who is growing by the minute!) who we absolutely adore and so do our friends and family. The first picture is of his first experience of snow the week we brought him home- he fills that tub now. The others were taken over New Year. We will send more over the coming year. I hope this finds you well and thank you for our amazing little chap! 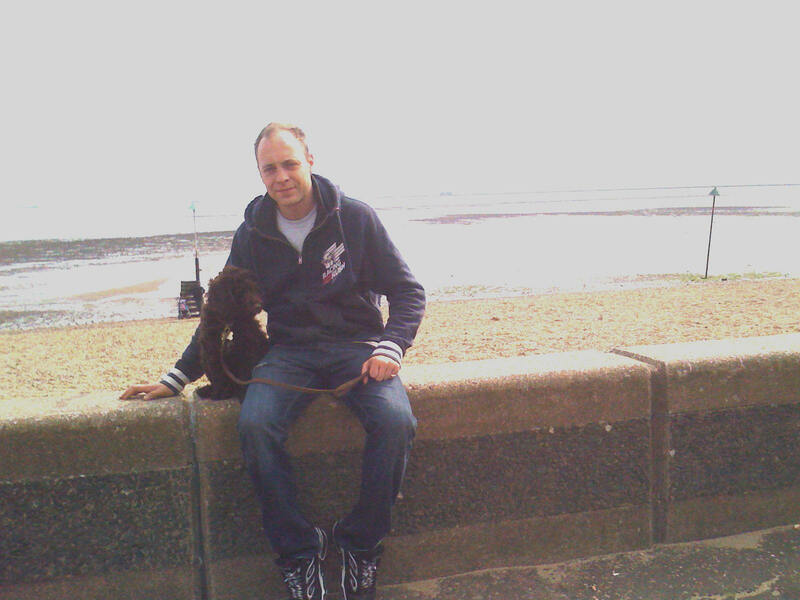 As you can see Meggie has grown up into a lovley loving puppy. She has been so good nothing in house chewed other then odd rug on kitchen floor. She sleeps in her bed in kitchen and had very few accidents since she came home on 13th July. She is very good on car trips this picture was taken when Linda went to Cornwall to visit some friends. 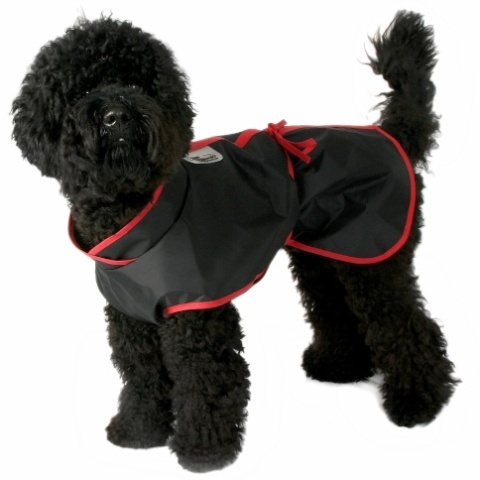 Meggies temperament is a tribute to your breeding and care given as newborn puppy. She loves walks on Dartmoor and along the river Dart and the company of other dogs that want to play. Everyone that meets her falls in love with her as she has such a great personality. Lilly (Candice), is great she settled in nicely and has been nothing but a joy to have. she has just finished puppy classes and passed top of the class, which wasn't supprising considering after having her 3 weeks she already knew most commands including walking almost to heal off the lead. (i've never known a pup tp learn so fast!!). She has become one of the most popular pups in the area with both people and other dogs all of whom see her and want to cuddle and play, and I am constantly stopped in the street by people asking questions about her and her breed. 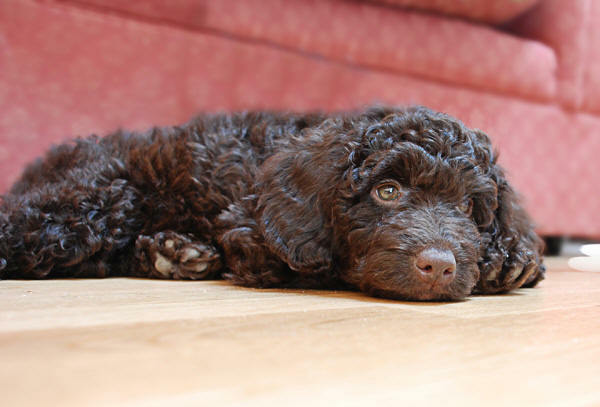 So thankyou very much, shes a lovely little pup hope you enjoy the pictures. I felt it would be interesting and informative to your future puppy families to hear my story and experience in how we came to choose our perfect puppy and breeder. 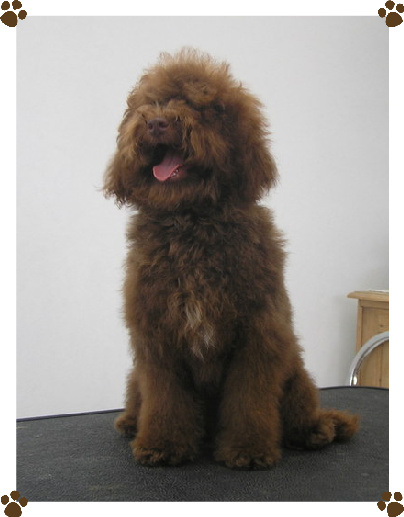 I really hadn't realised just how much information and types of labradoodles there were around; in look, temperament, fur and even facially. I thought it would be an easy task. I was baffled by the information on the internet. 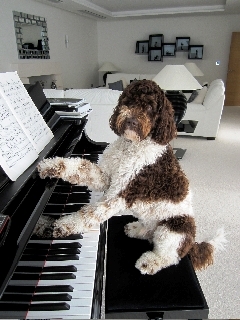 Eventually I came across an E book which I purchased on Labradoodles. It was a fantastic read; in turn this lead me to various other websites around the world; which then lead me back to Manornborn again! Great!!! ( I thought!) I was nearly there now and it was a toss up between two breeders, so my search had been condensed greatly. I was now in search to find one "in real life" instead of looking at photo's on-line. 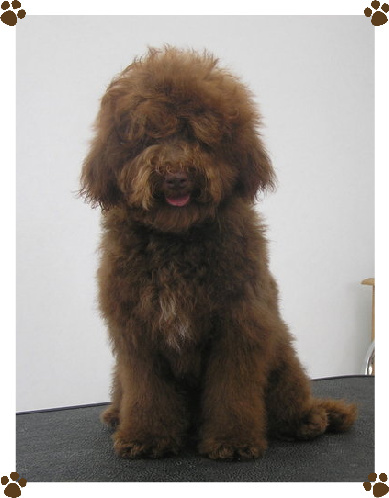 I visited my local parks and saw various sizes and looks to the "labradoodle" but none of them looked like the ones on Manorborn's website that I so longed for; my search had come to a stand still. 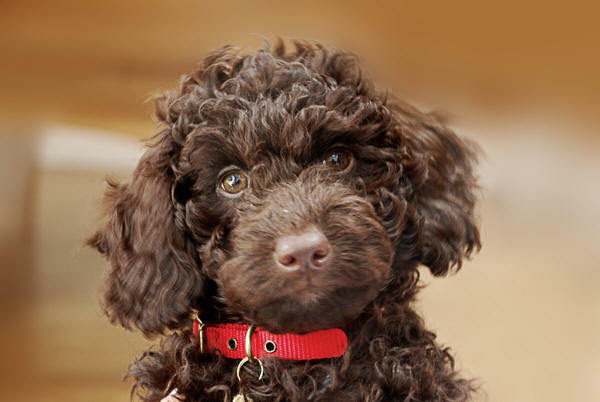 I asked everyone I met with a labradoodle over the course of many more months where they had bought their doodles from and took note. Some people said they had paid very little and some had paid more! 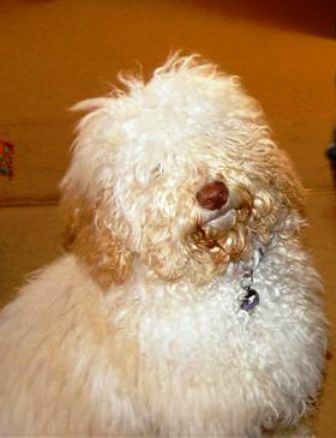 Some came from the breeders unwell (they said) and some had their puppies couriered to them from the breeders which I had read is not generally considered good practice. I knew I wanted to see the parents of my puppy and where he had lived for his first 8 weeks of life anyway. I was nearly ready to give up on my search altogether because I found the research all too much and wasn't sure whom to trust. I called Manorborn and another breeder one more time asking both breeders the same question. "If I can't visit you before I buy a puppy from you. How do I know I'm going to get an authentic ASD like the ones on your website?" 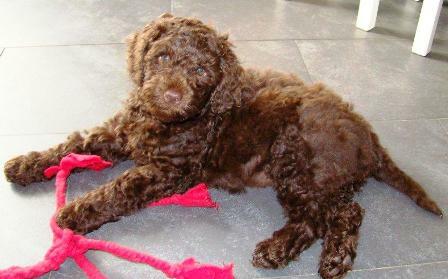 I wasn't prepared to go ahead and spend a huge amount of money on a dog that looked like the ones I'd seen in my local park when I wanted one like the one's I'd seen and read about on-line ...I felt deflated. I remember when calling you to ask this question the patience you and your daughter had with me as I told you how I was feeling and you listened and answered all my questions and kindly lead me to another owner of one of your puppies not too far from me. Do you remember that? being patient and reading up on choosing the right puppy and breeder really does pay off. 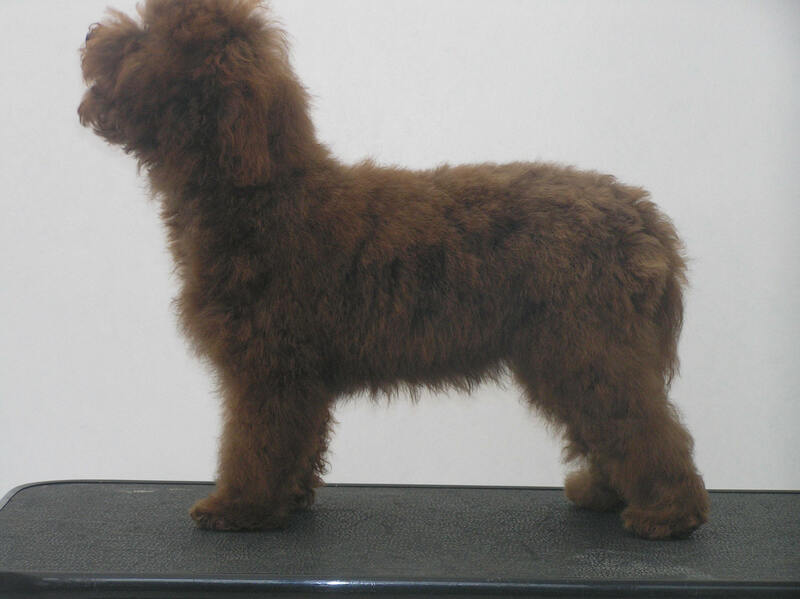 Manorborn in my opinion are the most pleasant and informative Labradoodle breeders to talk to and are truly dedicated to this wonderful breed. 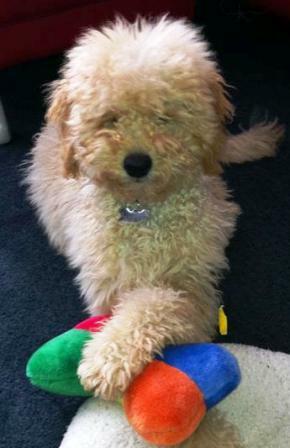 I felt rest-assured my puppy was coming from a great breeding stock and it was worth the wait and patience to find him . We joined Manorborn's waiting list and counted the months then the days. Our beautiful Diesel was born 3 rd March 2010. Manorborn sent me photo's every week and updated me regularly. At week five we went to visit; you can imagine how excited we were. Greeted by two wonderful ladies as nice in person as on the phone and walked into this beautiful and clean home to see our new baby and his parents. Before we went in we had to have our shoes dipped in disinfected and our hands disinfected too. I was pleased to do this. It was another confirmation to me that Julie & Rai were considering the health of the puppies and I now understand why you just can't "turn up!". They take no chances. On collection day we came home with all the correct paperwork, food, puppy pack and Rai had spent along time with me showing me the health checks of Diesel's parents and beyond. My vet was very impressed by this when I took Diesel for his first check. 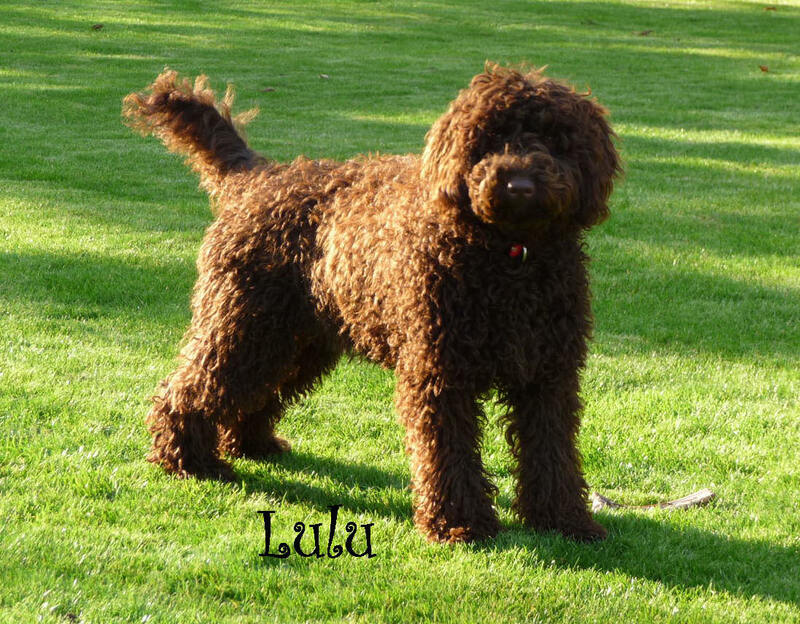 I am now a member of "The UK Doodle Club Labradoodle Forum" where I have found new friends and doodle lovers alike and met up with a few too. Thanks Julie & Rai from Manorborn; Diesel is everything we wanted and more!!! I enclose some photos taken today. I haven't sent you any photo's recently so thought it was about time i did. 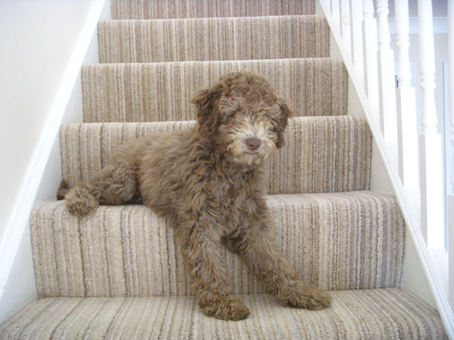 Its been nearly three years now since we first met you both and your beautiful Labradoodles and pick up our wonderful doodle who is such a special part of our family. Over these past 3 years of owning Scruffy and coming in contact with other dogs one thing has become so clear, the importance to chose a GOOD breeder, a breeder who genuinely cares about their dogs, their health, nutrition, temperament and well being, and will do their utmost to make sure that their dogs have not only the best start, but best life in a happy home. I feel so thankful that we did find that 'GOOD' breeder at Manorborn. They are truly wonderful dogs, who if you put in the time are so easy to train and willing to please. 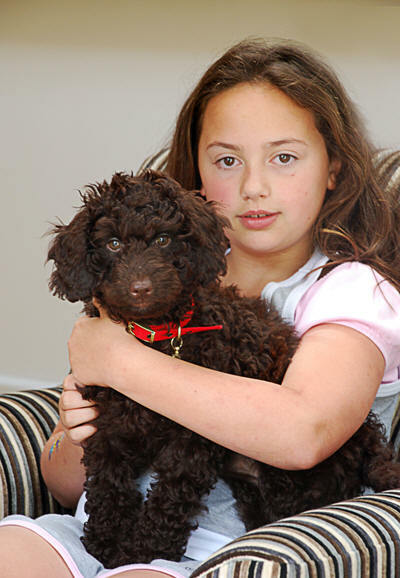 I have had more positive comments about Scruffy than I can ever remember, and she has helped quite a few adults and children I know ,overcome their fear of dogs. Thank you once again, and keep up the good work, we need breeders like you!! 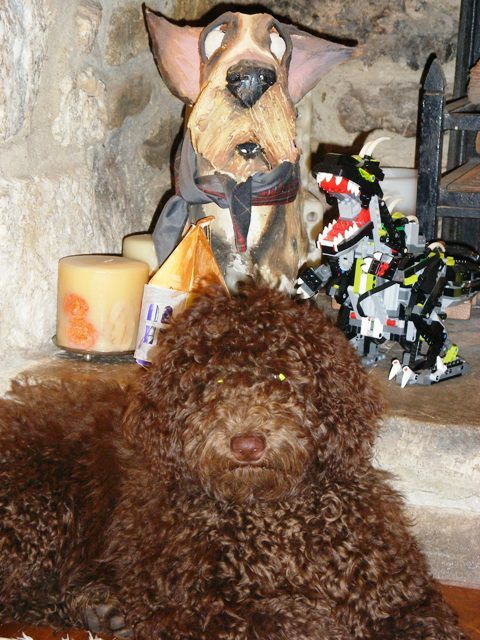 I just thought I'd send you some gorgoeus pictures of the delightful, yet still naughty, Toby and Bertie. They are both so gorgeous but different in their little ways. They're still getting into mischief, as you know, and also thanks for all the advice you've given me since their last escapade. It means so much that you're both there for me even though I've had Toby for over two years, Thank goodness I can ring you! Bertie is much better now and back to his usual mischievous self, he is so clever, he isn't called Bertie Houdinikins for nothing. Toby stands watch while Bertie does the deed, they also share the proceeds of whatever they've done. They also have a new game, a cross between hide and seek and 'tig'. It's so funny to watch. They're still turning heads as they are so stunning to look at. The vet who treated Bertie thought he was fabulous, I gave him your contact number, I hope you don't mind. I've sent you a copy of my favourite photos, hope you like them. Thanks again for being such caring breeders, I must bring them back for a visit, maybe in summer. 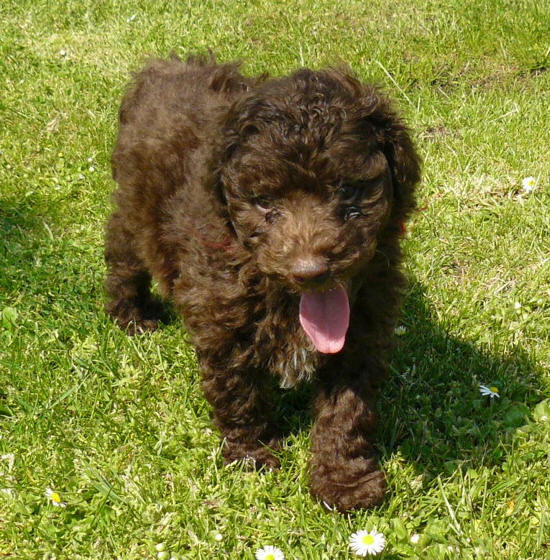 Here is an updated photo of Dexy in our garden. She is absolutely adorable and we are all madly in love with her. She is admired everywhere we go and a walk in the park can take twice as long as normal since so many people want to stroke her and ask what type of dog she is. She has an amazing temperament and is fantastically sociable and super intelligent! I have to thank you again for breeding such a beautiful, lovely natured dog who has added so much happiness to our lives. Firstly many apologies in the delay in replying, but my computer had a major problem and I've been without it for weeks. Its been such a pain !! 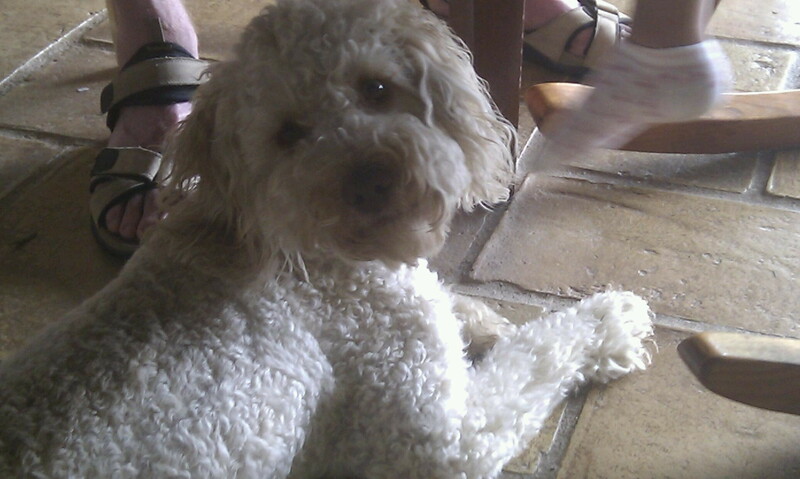 My parents have just come back from holiday with Ollie - his first holiday! 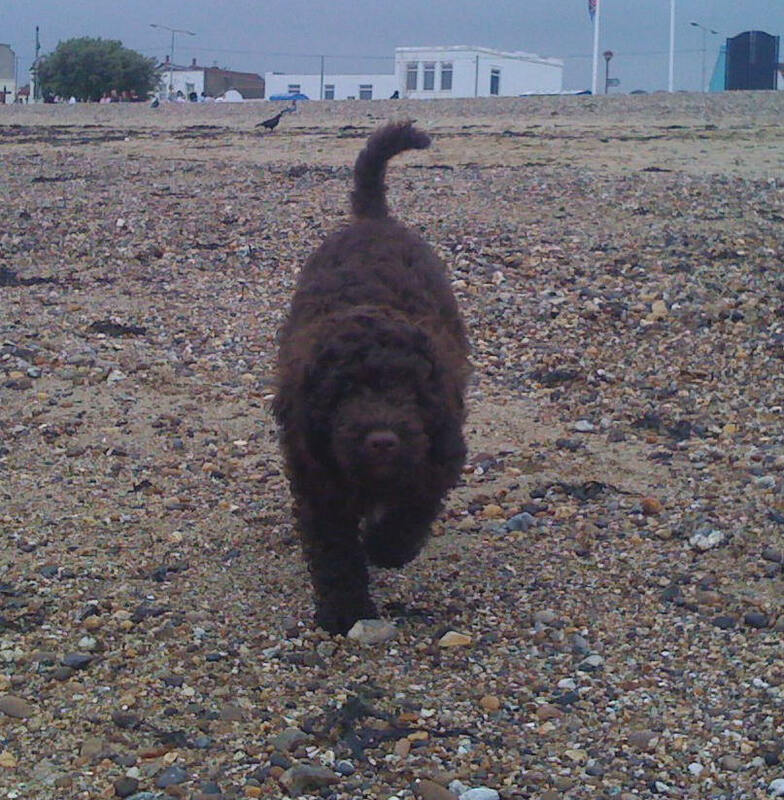 They went to the South Coast and he had an absolutely great time on the beach playing with lots of other dogs and in the sea (he just loves water)! 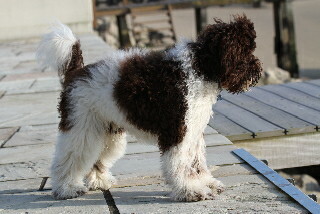 He is a wonderful dog with a fantastic temperament. He has been a dream to train and is so willing to please and great with kids. My mum just loves him to bits and I'm so pleased for her, because her last dog sadly had a lot of personality problems. I've attached some photos of him. One with his best Airedale mate, before and after haircut, one showing how brilliant he is with our chickens, with my little niece Lucy and lastly one on his holiday (which gives you an idea of his size - about 16"). Hope you can open them. Hope you and Rai and all your lovely dogs are well and are not finding this weather too hot. 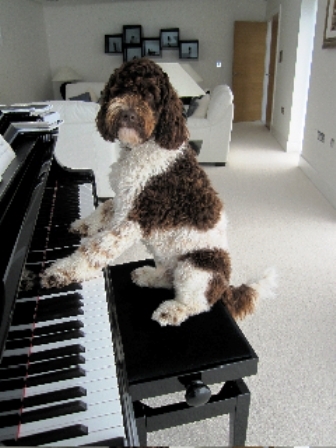 Hi Guys, we just received an email to say that one of our doodles from Corrie's litter, 2 years ago is in a music band, getting in the limelight. My husband has had no allergic reaction to Lu Lu whatsoever. He can't believe that he can give her a cuddle and often does, as he has never been able to even touch other dogs. I have attached some pics and will send some more to you or website. Sorry for the delay but a bit bogged down with my sons leavers yearbook. Will keep in touch. Chewy is doing amazingly, he's the best boy we could have ever asked for, he has done everything right an is learning so fast. There is no comparison between the Australian and other ones we have seen. I will send you some pictures very soon - got loads to send you. I just watched the slideshow - very nice !! 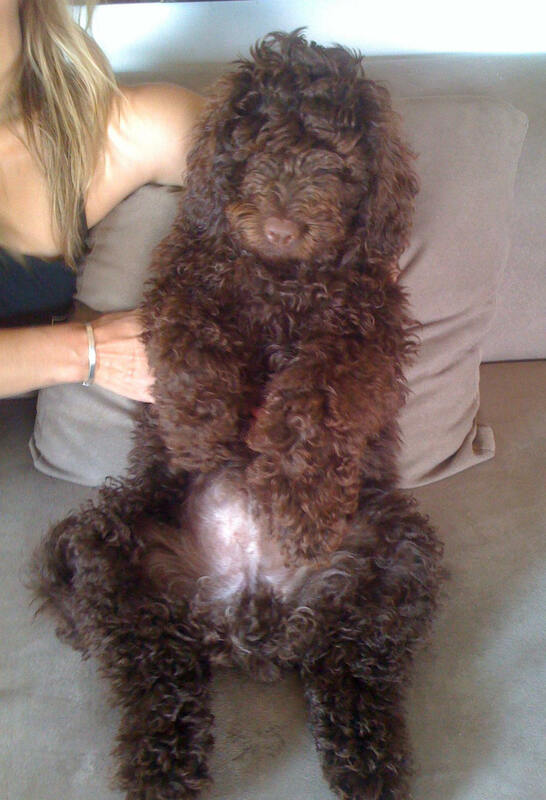 Time flies doesn't it - Chewy is 4 months old!! He is doing amazingly - he learns so quickly, especially when there are nice treats around. We are so happy, I can't tell you! First news I have for you is that Chewy has graduated. He came top of his class and I think was the teachers favourite!! The other news I have for you is that on the wknd, we went to the Cold Wet Nose Show - I'd thought it was just a bit of fun where Chewy could meet other dogs. It was a bit more serious than that! 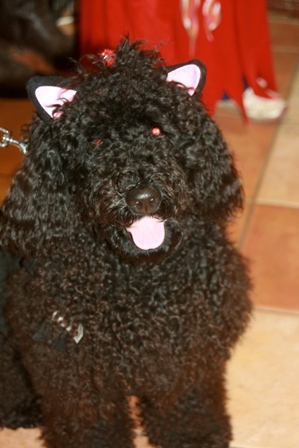 Everybody was entering their dogs into competitions for best dog. 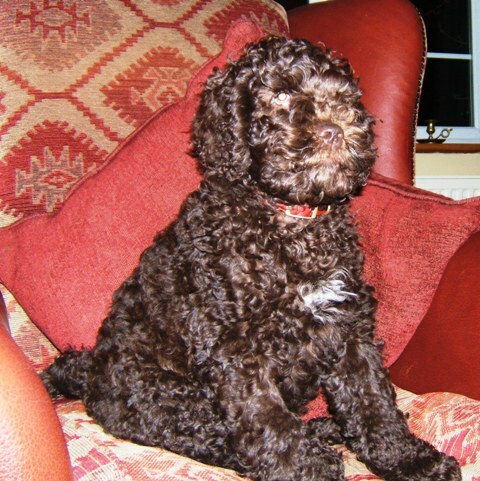 Just for a laugh, we entered Chewy into most loveable rogue - exactly what he is ! He won 2 heats and ended up in the main ring with 8 of the other category dog winners (last 8 out of 1700 dogs!). I have attached some pics - sorry I have been so lazy about posting pics on the website thing you sent me - I need to get onto that. I have been storing all the pics though and soon will get organised. 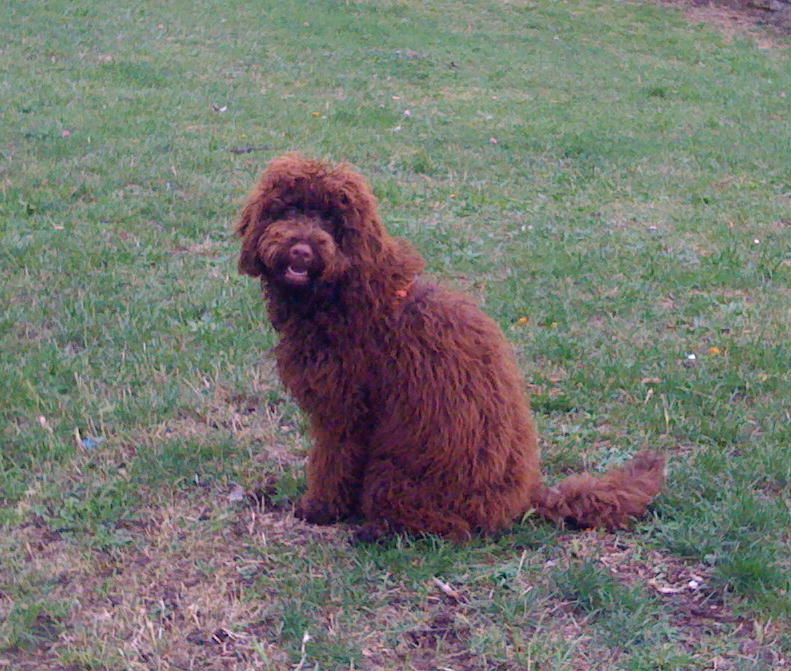 Before you ask Chewy's girlfriend is an australian labradoodle - - we met her one day on a walk!! She was very cute. Ziggy has made a big impression on the many dog owners in the village Not just because he looks cute but also his temparament and his size. 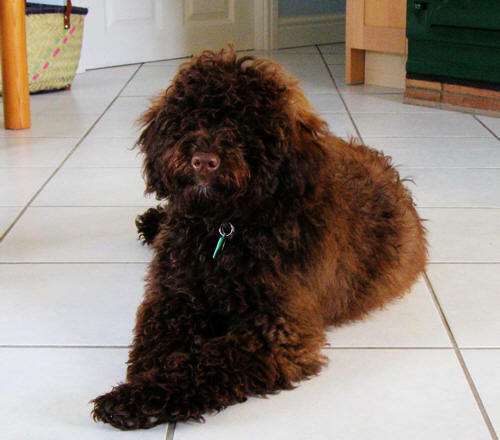 Most people don't seem to realise that small versions are available their experience of labradoodles is mainly with large and very boisterous F1's. 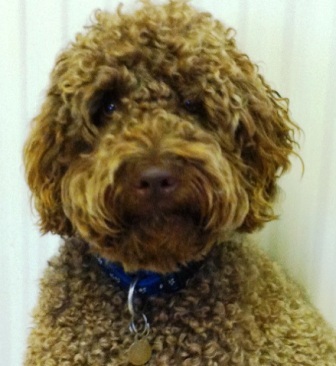 By comparison, Ziggy is extremely civilised and he's proving very easy to train. He still has an amazingly soft fleece coat which is thickening up as he grows with the lighter colour coming through from the roots. His face and feet are slightly darker and in the sunshine there is a definite red tinge to his coat. Quite a complex colour and absolutely beautiful. It will be interesting to see how this develops over time. Cosmo is being a brilliant boy! i joined uk doodle club. he does his business in the garden and did it only a few times in the house. he had a lovely bath and we put some flax seed oil on him and his coat is soft and shiny. he was wonderful in the car and loves looking out the window! The vet gave him some ostrich tendon while he was having his check up and he adored it! my mum and dad are so tired they say its like having a new born baby! but we all really love him. he follows us all around the house and sits at our feet. when he gets excited, he gets a bit nippy - but now he's starting to learn not to. He is a lovely boy and is sleeping all day! Lots of love Liberty Rachel, Tom, Josh, Tilly the hamster, Chedder and Monty the gerbils and of course the adorable COSMO!!!! Updates for Pommy if you would like to include it with the others on your lovely site (brilliant I might say!) then please feel free to do so. I will update with more photos shortly. Our little Pommy (Manorborn Charm) is a true charmer! She charms everyone that comes to our home with her wonderful bubbly personality and cheeky playfulness. She follows me EVERYWHERE and when my feet are still for long enough she likes to curl up on top of them and goes to sleep - even when I'm stood at the sink washing up (which is quite often!). She comes with me to collect the children from school and loves the car journey. 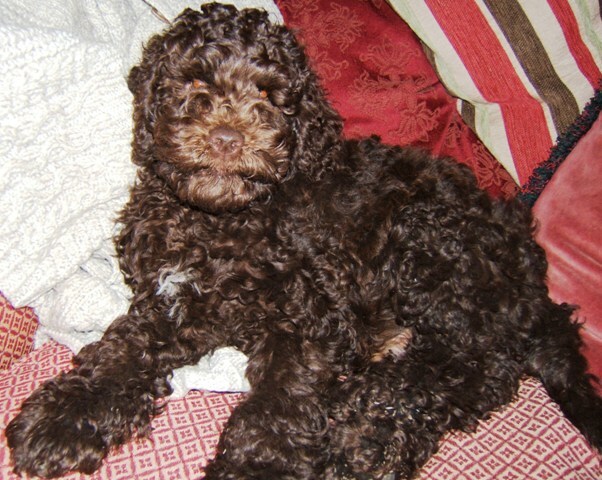 She is the most outgoing and sociable little puppy I have ever had and she and the children adore each other. She has never had an 'accident' in the house and from day one went to the loo outside. She settles in her puppy crate at night, which she shares will Jenny Wren and the two of them are real buddies - Jennie showed her all around the garden when she first arrived - and now she knows where everything is. She even lies in the greenhouse while I water my tomatoes!!! Thank you for the most adorable little companion - a real Charmer! 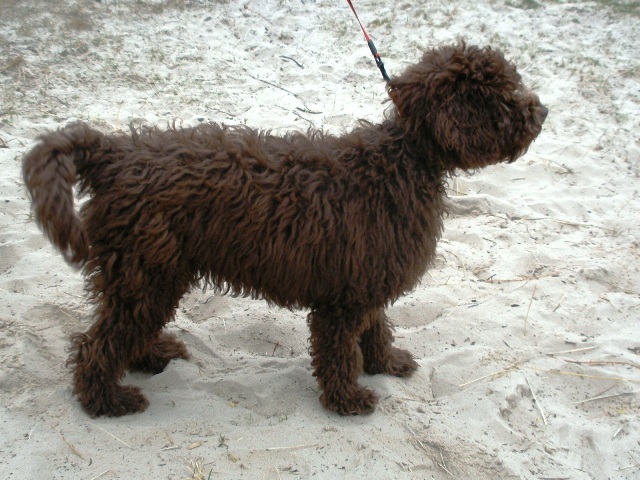 She is a Chocolate Miniature ASD bred by Julie of Manorborn. Dottee is a little sweety but she is scared of nothing. She will be fully health tested at 12months. Thank you Julie for my little sweetheart. I've been busy grooming Dottee today, here are some pic's for you, I really should have taken them outside but I will next time, it's raining now anyway. Dottee is fab, she is still tiny at 13", she has lovely conformation and balance, luv her to bits. These photo's don't do her justice, she looks like a little Newfoundland in the flesh. Promise to get better pic's soon. is adored by us all and we can't imagine life without her now.